This dish can be made with either minced or ground (as they say in the US) chicken or red meat. Either way, the method of cooking is the same. Spices: 1 heaped tsp salt, 1 heaped tsp cumin, 1 tsp paprika, 1 tsp chilli powder, 1 heaped tsp coriander powder, 1/2 tsp turmeric. 1. Wash the meat really well taking care to wash away all the blood. The meat should be light pink when you’re done. 2. Finely dice one onion, the garlic and ginger as indicated above and keep separate. 3. First fry the onion in 1-2 tablespoons of oil until the onions are quite brown. Add the garlic and ginger and continue to fry for 2-3 minutes on high heat. 4. Add all the spices and the salt as indicated above. Fry for 2-3 minutes stirring all the while. Add 1/2 cup of hot water (preferably from the kettle) and make a smooth paste. 5. If you are adding potatoes to the dish, now is the time to add them. Make sure they are cut into small cubes; the smaller they are, the quicker they will cook. 6. Now add the ground meat or chicken and fry for approximately 10 minutes on high heat, allowing it to dry up. If it starts to dry up too much, add 1/2 cup of hot water. 7. Now add the peas and stir well. 8. Make sure you have enough moisture (ie, that it’s not too dry) and put the lid on, lowering the heat to a mere simmer. 9. Simmer for 10 minutes and you’re done. 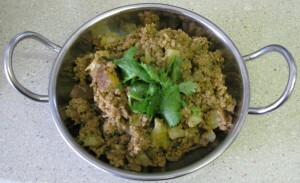 Recommendations: Keema can be eaten with white or brown basmati rice, with naan or chappatti or even pita bread if you like. For a really tasty meal, try it with Moong Daal (yellow lentil curry).